Hmm I think there is much more to it then that. I know it seems paranoid. Here is something Snowden recently retweeted. 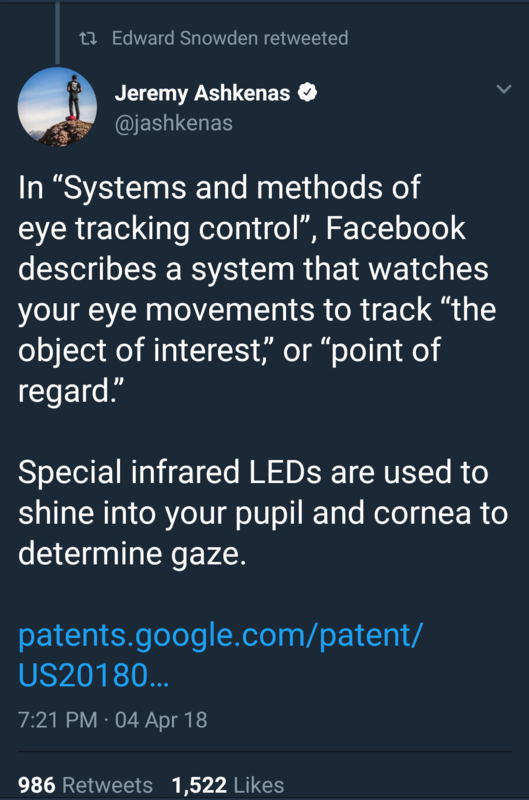 Also search for facebook patents. They say they do not use all they patent. They don't currently have to tell us if they do. If you read comments in that tweet there is more info as well the author provides. Also I shared a few days back read anything related to Facebook's "people you might know" feature. There are many horror stories out there! The commissioner said firefighters went with the Secret Service to inspect the president’s residence. While the rest of the building had a “considerable amount of smoke,” it was not immediately clear if it reached Mr. Trump’s unit, he said. A "fireman" (or woman) could have easily placed something or swiped something. She said that she did not get any announcement about leaving, and that when she called the front desk no one answered. I wonder if Cohen was in the loop? If you view Q as a human informant, you won't be so hard on her. Don't think of Q as a soothsayer, or predictor of future events (ie HRC Video, Obama w/AK47, etc..). That's just the human-ego side of Q... wanting to be bigger than reality...like "informants" often do. Sure sounds like he knew blackhats were coming. Did they just sacrifice the guy in the 50th floor to plant evidence in Cohens office? Hmm. Maybe the guy didn't even exist. U.N. Ambassador Nicky Haley eloquently (possibly) tipped our hand this afternoon while addressing the U.N.. She said that ASSAD is the root of the problem. Get rid of Assad and it's doubtful that his replacement would be more evil..or even as evil. I hope a single cruise missile sends him into oblivion... and that's the only one we fire. That would be PERFECT. Looks like you are onto something. Also the smell of Sulphur seems to hint at an incendiary device or accelerant. Maybe NOT an attack. That meeting between him and the top military brass has been going for a long time this evening. Russia sent out a message this afternoon saying that if we hit Syria again, they will respond in kind on U.S. Assets. Not a game now. No it’s not a game. Here is what I don’t understand, let’s say it is 100% confirmed it is Assad. Why is that worth risking a war with Russia? Let’s be honest 70 innocent people are killed somewhere in the world every day. Why is this instance worth potentially starting wwiii over especially since hundreds of thousands have already been killed in Syria. It’s just dumb, and I see zero good reason to launch an attack. If it is 100% confirmed it is Assad then we are going to attack Syria because Obama failed to do anything during his campaign where he said if Syria used chemical weapons then that would be a red line. However, with that being said here is what I really think. The CIA is behind the attacks to provoke Trump into a strike against Syria to provoke Russian into a response to make the American public have a negative opinion of Trump so when Mueller and the MSM continue to come out with their totally made up BS about "Russian collusion" there will be minimal support of the people to search for the truth.